The Patriots - on pedigree alone - should win this game. I am wholeheartedly rooting for this as I badly want to see Mr. Ginger Tyrant scrape some egg off his smug face. However, Atlanta could pose some serious problems. They are young, fast and balanced on both sides of the ball. 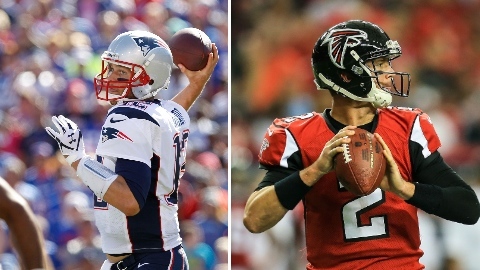 Game Prediction: Patriots 30, Falcons 28 in a squeaker. Should be a good one. Screw the Fraudger. Discuss below. I don't care who wins as long as the Pats Receiving Crops does not get 96 fantasy points between them. I would normally root with my whole heart for the underdog in a game like this, but the idea of Rodge handing over the trophy to Tom Brady is just too funny to be totally against another New England title. I think we will win. But, Atlanta is a very good team and I can easily see them winning. I'm torn, a little about how I would like to see it go down. Part of me wants a close game that comes down to the end and is a classic no matter who wins. Another part of me wants the blow the Falcons out something like 35-10 just so the whole dissing of the #1 scoring defense looks even dumber than it already is. I don't do score predictions, but my MVP prediction is LaGarette Blount. This is so awesome. Beast Mode is too chill. Alan Faneca/Kevin Mawae- best of the eligible OL, both should be in, but I'll say both are OUT for at least one more year. I don't sense momentum for Kevin Mawae, but I don't get it. His case is just as good as Faneca's. I think Faneca would get in ahead of Mawae and is the first one out. He could very easily get in, likely at the expense of T.O. John Lynch- There are only 4 defensive candidates, and none are locks. I think one gets in, and while I think Brian Dawkins was the slightly better player, I think Lynch is IN. Jerry Jones/Paul Tagliabue- The contributor and senior candidates have a major advantage since they simply need to hit the 80% threshold and don't have to worry about other candidates. I think both get in this year. Both of these guys should be a lock. Kenny Easley- I guess this is the year of the 7 season candidates between he, TD, and Boselli. I mean, good for him and everything, but did anyone watch Kenny Easley and think "hall of famer"? I remember him and remember watching him, though I didn't catch too many Seahawks games at that time. He was a nice player, but for a guy playing so few season, you need to have transcendent seasons. TD? Yes. Easley? Not so much. OUT. And finally was have Tony Boselli. Seriously? How does he get the finalist nod over Roger Craig or Hines Ward? Heck, let me throw in Clay Matthews, who was a semifinalist for the 2nd time, but has never been a finalist. How does Clay Matthews continue to receive little to no consideration? That dude didn't even make our list of best players not in the HOF from a few years ago. Bad job by me on that one. He at least deserves to get one shot for someone to take up his case in that room. But Tony Boselli? Based on what? Hype? If he gets in, next year we should make a case for Mike Mamula. You certainly should have that league locked up. The real battle is for 2nd/3rd. The dude with the entire Pats receiving corps plus James White is in 2nd, while the dude with Ryan/Julio/Gostkowski is in 3rd, and the dude with Brady/Lewis/Bennett is in 4th. So Jason Taylor ends up with the defensive vote (I have little problem with that) and Morten Andersen gets in over T.O. or one of the OL. Jerrah gets in, Tags was left out again, and Easley gets in. Congrats to him, but I don't get it. Patriots will blow out Atlanta by double digits and score 40+. The Atlanta defense has no chance at stopping the Patriots and can't even come close to putting pressure on Brady. Plus they will be so worried about stopping the pass, that Blount will run all over them. The only thing that might make this close is if the Atlanta offense can keep up. This will be such a dog of a game. The only interesting thing will be the trophy presentation at the end. The Falcons have that relatively small defensive front that makes me think Belichick may treat this as a LeGarrette Blount game. But if there's concern that they'll have difficulty shutting down the Falcons, that game plan could change in a hurry. I'm not sure there's "dissing" of the Patriots' #1 defense. It's clear their defense has played very well. That they faced a weak schedule this year is fact. They had 6 games against a bottom 10 per-play offense and 2 more against Matt Moore/Landry Jones. To their credit, they've also obliterated those teams. While the Patriots have a very good offense and a solid defense, the Falcons are an all-time offense. They scored the 7th most points in NFL history and led the league in yards per play despite facing the toughest schedule against opposing defenses. Matt Ryan put up the best YPA (9.3) of any QB to ever throw more than 400 passes in a season. Again, against the toughest opposing defense schedule in the league. The Steelers were too reliant upon their big 3. When Bell went down, the Pats bracketed Pittsburgh's freak-of-nature WR and the Steelers had no one else to step up and help out Big Ben (not saying that would have made a difference-- the Patriots could have named their score in that game). Going into that game, at full strength, the Steelers had a good offense that was the best NE faced all year (by far), but the Falcons are a completely different animal. They have a much more diverse offense that just so happens to also feature an unstoppable freak of nature at WR. But even when Julio missed 2 games this year, the Falcons scored 42 and 41 points. We know how the Pats will respond tomorrow. I think the Falcons will embrace the moment, and I think they're hungry. Matt Ryan is just old enough to have the appropriate amount of urgency with this opportunity, and Dan Quinn got the Pete Carroll gene in how to keep a team loose. It is very tough to pick against New England, but I usually side with the team that owns the most dominant unit, and that unit belongs to Atlanta. I don't know if their defense can slow down the Patriots' offense or not, but I do know they're young and have improved as the season has gone on. The Falcons just took down a team with a similarly great offense that also has a championship-pedigreed QB. The Patriots have not faced an offense like Atlanta's. In Vegas, most of the public money coming in is on New England, yet the line hasn't moved, and if anything, is trending toward Atlanta. That means the sharks are all over the Falcons. Strip the logo off the helmets and I feel like Atlanta would be about a 4.5-5 point favorite. The experience of Belichick and Brady represent that entire line differential, and that's very fair. But they've lost before and I think they're going to lose again. OMG. All I can say is OMG! I'm sorry, but this is my job. Rich somehow falls to 2nd in our playoff league. Trust me Rich, I was rooting for you. I'm never going to hear the end of this from the guy who made the comeback. So, do I get best strategy award? Listen to the Boo's for Roger at the Super Bowl! Dude... I like you.... 2 Years in a row... I had it right. Never telll me I had it. To be fair, I said "should". I know your history, and I know the luck of this clown who won it. In the first year of my home league in 2003, he started his draft with Favre, Gannon (1 QB league), David Akers, and Chad Morton. Seriously, there are a few people in my league who thought for the first few years that I was making him up-- that he was a product of my imagination and that I created his team as a joke. He's now won 3 league titles, 2 playoff titles, and in his mind is our most decorated champion. I also have 3 titles, but only 1 playoff championship. Trust me, I was pulling for you. Hard. As far as this old football fan is concerned, the debate regarding which quarterback is the best ever was settled last night. His name is Thomas Edward Patrick Brady, Jr.
Now that it is the morning, I have to just laugh that it took so many things that had never happened before to take it down. That dude certainly has luck that I have never seen. Incredible. Almost as incredible as the game itself. That has to be the best game and best comeback ever. Obviously, 5-2 looks way better than 4-3. And, yes, I do think it shut the door on the question whether or not we are seeing the best coach/QB combo in history. Maybe in all sports. Pop and Phil Jackson have arguments, but I think basketball is an easier game to navigate than football. Its unarguably the best QB/coach combo. But I'm not giving Brady any kudos for last night. You stink three quarters and you finally show up against a poor defense in the fourth quarter.